Humankind has grappled for millennia with the fundamental questions of the origin and end of the universe--it was a focus of ancient religions and myths and of the inquiries of Aristotle, Galileo, Copernicus, Kepler, and Newton. Today we are at the brink of discoveries that should soon reveal the deepest secrets of the universe. 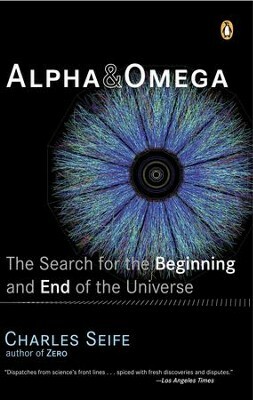 Alpha and Omega is a dispatch from the front lines of the cosmological revolution that is being waged at observatories and laboratories around the world-in Europe, in America, and even in Antarctica--where scientists are actually peering into both the cradle of the universe and its grave. Scientists--including galaxy hunters and microwave eavesdroppers, gravity theorists and atom smashers, all of whom are on the trail of dark matter, dark energy, and the growing inhabitants of the particle zoo-now know how the universe will end and are on the brink of understanding its beginning. Their findings will be among the greatest triumphs of science, even towering above the deciphering of the human genome. This is the book you need to help understand the frequent front-page headlines heralding dramatic cosmological discoveries. It makes cutting-edge science both crystal clear and wonderfully exciting. Charles Seife is the author of five previous books, including Proofiness and Zero, which won the PEN/Martha Albrand Award for first nonfiction and was a New York Times notable book. He has written for a wide variety of publications, including The New York Times, Wired, New Scientist, Science, Scientific American, and The Economist. He is a professor of journalism at New York University and lives in New York City. I'm the author/artist and I want to review Alpha and Omega: The Search for the Beginning and End of the Universe - eBook.